This package contains 50 rounds of Speer Lawman .40 Smith & Wesson ammunition. Each round is loaded with a 165 grain total metal jacket (TMJ) projectile. Delivering deep penetration with minimal terminal expansion, these loads are a great option for target shooting, tactical drills, and good old fashioned plinking. Speer’s Lawman line was engineered to deliver the same feel and point of aim as their premium duty rounds, providing an excellent and practical load for training, and providing a smooth transition to your everyday carry ammo. 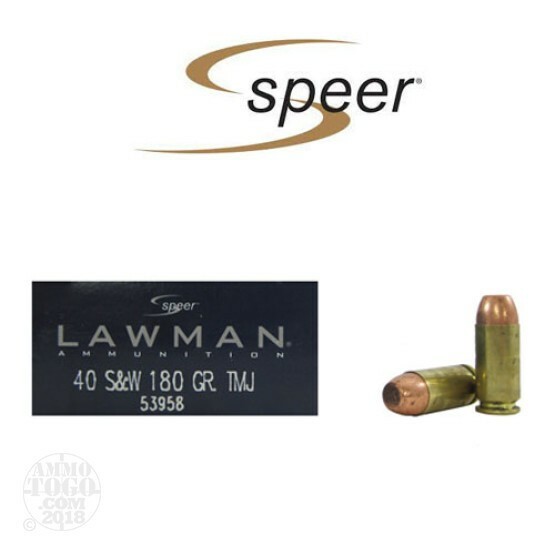 Speer Lawman is manufactured using only the highest-quality components. Featuring clean-burning powders, CCI primers, and premium reloadable brass casings, these factory fresh rounds deliver consistent pressure and velocities for reliable down-range accuracy. Leaving the muzzle at a velocity of 1150 feet per second with 484 foot pounds of energy, Speer Lawman .40 S&W ammo delivers reliable performance with every pull of the trigger.